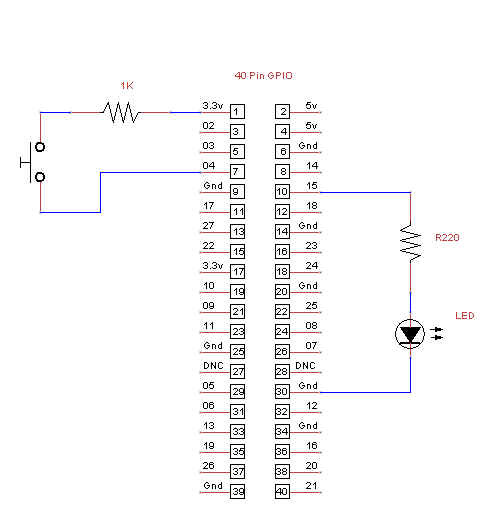 The following script is designed to turn on an LED whilst a button is in a depressed state and turn the LED off when the button is released. When run however the LED comes on whether or not the button is held down and stays on regardless. I've tried all day to find out what the problem is but to no avail. Can anybody help me identify what might be the problem? Thanks! Well running your program the LED turns on as soon as the program is run pressing the button turns it off then the program exits as per the program. this code will actually do what you say you want. Thanks however when I run your script all I get is LED OFF printing down the page. When I press the button nothing happens. The LED doesn't light at all. This is not what I want but at least it seems to show that things are working as they should. For your original code and my code to work wire button/LED like this. I would recommend adding a 1K protection resistor in the switch circuit in series with the switch. Actually I have just modified an old door alarm script I had and got it to do what I was wanting. 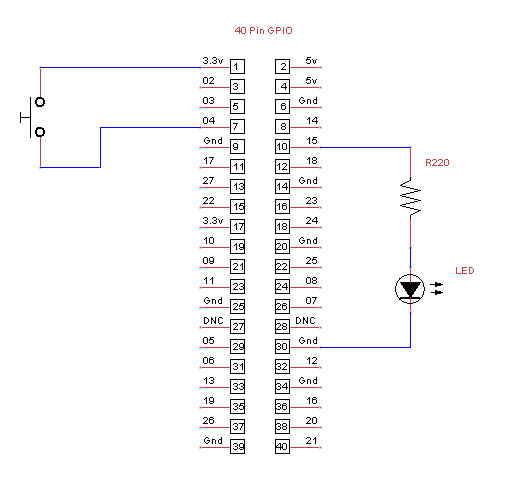 Both pins are connected to ground. I have a resistor on the led but not on the switch. You think that is OK? The 1K resistor is just there so that if you set the switch gpio pin to an output and your switch shorts it to a low/high voltage pin you don't damage the gpio pin due to high current flow. Ok thanks. Sounds like a good idea. So in my setup with the script I just posted I put the 1k on the switch and 220ohm on the led. Is that correct? Updated my diagram to show 1K resistor added, does not matter which side of switch as log as its in series.